Photographer(s) Appreciation: Today's image was photographed last September in a Venice, Italy market by Kimberly T of California. Many thanks, Kimberly! A top-notch piece of writing on this plant exists online, so rather than trying to retell the story, I’m going to recommend you visit this page: Fractal Food: Self-Similarity on the Supermarket Shelf by John Walker, founder of Autodesk, Inc. and co-author of the well-known AutoCAD software. To give a hint of what you’ll find on the article, John’s divided his (released into the public domain) essay into a few parts: The Unclassifiable Romanesco, A Computational Universe?, Stalking the Vegetable with a Camera and Fixing Fractal Food–perfect Botany Photo of the Day fare. Delicious to eat too, not just to look at. Inspiring!! I have baby broccoli Romanesco growing in my garden right now, from seeds imported from Italy. I hope at least one of mine grows to look like your photo. Yeah, I once saw it in Food Co-op in Mount Vernon, WA and was so amazed. I stir-fried it with some regular broccoli and ham, which tasted really good, and of course, looked beautiful! Amazing! 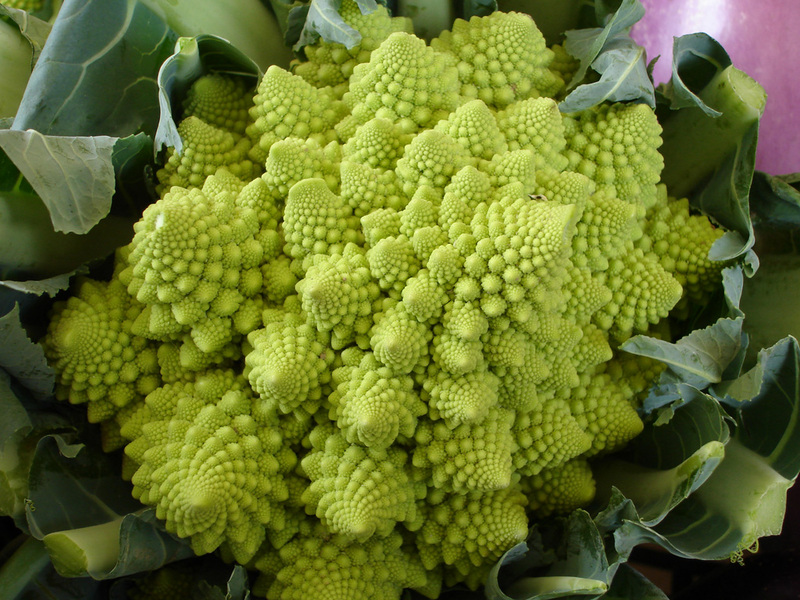 How or where can I buy some Brassica oleracea [Botrytis Group] ‘Romanesco’ seeds ? this is the craziest thing ive seen, i once saw it on the veggie market early morning, proof that God likes his psychedelics as well as us. This cultivar is highly modified by humans. If you are specifically referring to the spiral pattern, that’s often seen in nature and explainable by mathematics. Thank you Dave for introducing me with new plant. It is so fascinating. Leave a Reply to Justine Click here to cancel reply.